Excogita develops and realizes test benches and special machines for AEROSPACE, MANUFACTURING and MEDICAL applications. Many years of experience and advanced training make the company leading manufacturer of customized machines, for testing or for production departments where are asked machining and assembly processes with boost automation. Systems with formula "turnkey", with assistance guaranteed throughout Europe. Able to get the best performance thanks to the combination of the most sophisticated techniques FEM with new Additive Manufacturing technologies included in production department. Excogita is system integrator of the most important international brands of industrial automation, including National Instruments, Festo, Siemens, SMC, Bosch Rexroth, Schneider Electric. Excogita also provides mechatronics engineering services aimed to innovation of product and process, following a specific "project management" for the development of new ideas, supporting the customer during the entire life cycle of the product. Complete supply of test benches for product development and production control. Design and realization of measurement chains to evaluate the physical quantity of a system, the efficiency and durability. “Turnkey” formula for production machines, equipment, automated and robotic assembly lines. Direct customer service, preventive maintenance, remote assistance. 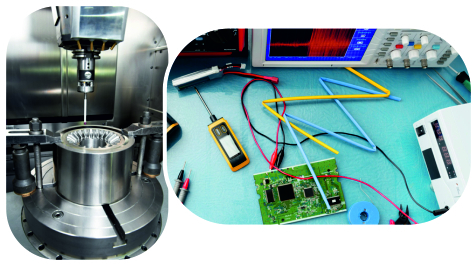 Test bench and special machine certification and calibration. Mechanical and electronic assistance, maintenance service and planned calibration of the product. Mechatronic, thermodynamics and fluid dynamics engineering analyses. Development of innovative products and processes, design and drawings. Prototyping and reverse engineering.